PHOTO BY RYAN WILLIAMSON Turcott's Taproom, a new concept which opened in the former Lola's space, is a gastropub with an emphasis on comfort food, like the Tavern Tots. 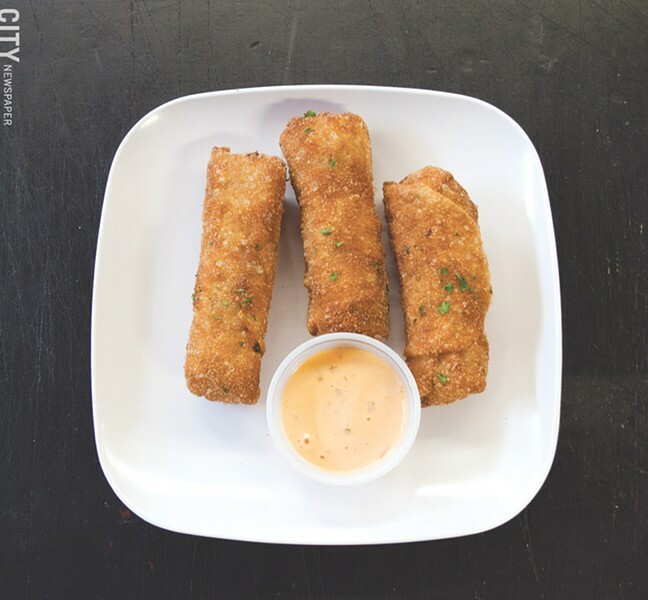 PHOTO BY RYAN WILLIAMSON Turcott's Taproom, a new concept which opened in the former Lola's space, is a gastropub with an emphasis on comfort food, like the Reuben Egg Rolls. Monroe Avenue patrons remember Lola, the candlelit cocktail bar and bistro that closed earlier this year. In early November, Lola reopened as Turcott's Taproom (630 Monroe Avenue). "Lola had run its course," says Chris Diamantopoulos. "Monroe Avenue has been going through some changes and we wanted to come up with something new." Turcott's is owned by Diamantopoulos's father, John, while Chris and his brother, Anthony, help run the restaurant. The name is a tribute to a friend and long-time manager that worked for the family for close to 20 years. Turcott's is a gastropub with an emphasis on craft beer and comfort food. The pub has 21 taps that will rotate and include some local craft beer selections from Three Heads, Rohrbach, and Naked Dove, among others. Executive Chef Dave Bunts ran the kitchen at Lola as well and has created a casual, hearty menu with new items like the Pot Roast sandwich ($8.99) served on a ciabatta roll with cheddar, Sriracha mayo, and crispy onions. The Chicken French, a staple at Lola, finds a home on the Turcott's menu as well. Billy's Chicken French Bites ($8.99) feature egg-battered chicken tender pieces finished in a lemon, sherry, and butter sauce. 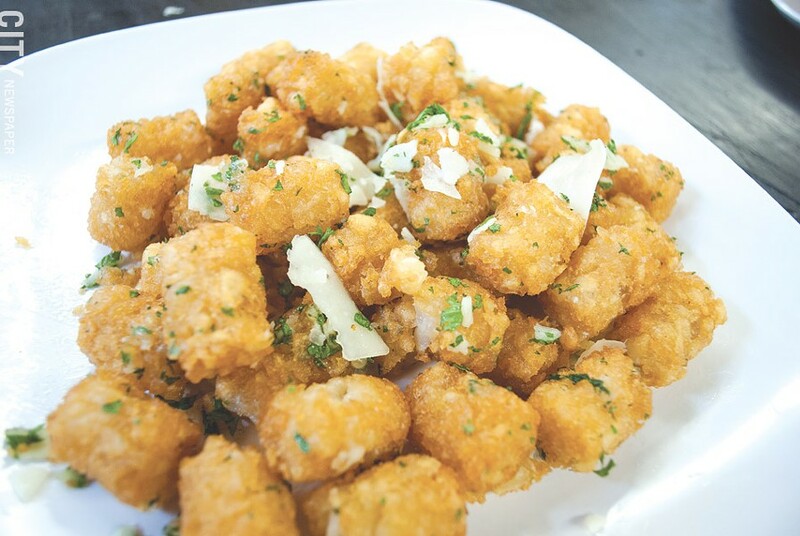 Those looking for a light nosh while watching a game on the big screen can look to the starters menu for items like Tavern Tots ($6.99), which are tater tots flavored with white truffle essence, Romano, Asiago, and Parmesan cheese along with fresh herbs or Reuben Egg Rolls ($8.99), stout braised corned beef, Swiss cheese, and sauerkraut served with Dijon mustard and tavern dipping sauce. Turcott's Taproom (630 Monroe Avenue) is open for lunch and dinner seven days a week, Monday through Sunday from 11 a.m. to 2 a.m. The pub will open at 9 a.m. on Saturdays to show soccer matches and 12 p.m. on Sunday for football. For those non-beer drinkers out there (yes, there are a few of you out there), Turcott's has a full bar and recently launched a new craft cocktail list as well. 271-0339. For more information visit its Facebook page at facebook.com/LolaBistroandBar. The Kitchen (5 Main Street, Pittsford) has released its one year anniversary menus, available until February 6. The five-course chef's table menu ($65) is available on Friday and Saturday nights only. The seven-course chef's table menu ($90) is available Wednesday through Saturday. Reservations are required and can be made by calling 310-2467 or online at cipollaromaine.com. Duff's Famous Wings has opened at 2425 West Henrietta Road. The Rock Shrimp Company (4755 Lake Avenue) has opened, replacing Nola's BBQ. Yager's Pub (510 Monroe Avenue) has opened in the space formerly occupied by Rehab Lounge. East of Chicago Pizza, a national chain, has opened at 2171 West Henrietta Road. Nucci's (807 Ridge Road), an Italian seafood and steakhouse, has opened in Webster in the space formerly occupied by Barbato's Bar and Grill. El Flamboyan Café (35 Chestnut Street) has closed. The Brighton (1881 East Avenue) has closed. EDITOR'S NOTE: This article has been updated to correct an error. John Diamantopoulos is the sole owner of Turcott's Taproom. Chris and Anthony Diamantopoulos help run the business.